Credit to the author is available on the webpage below. An article relating to the fake use of Doctorate title by Mr Levengood. Pretend you are a graduate doctor, while it is not so, just to own glory, that is not kosher. 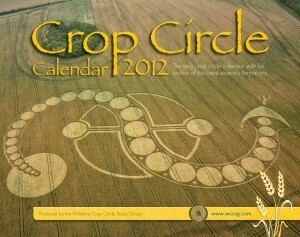 And yet such a situation seems to go hand in crop circle world. 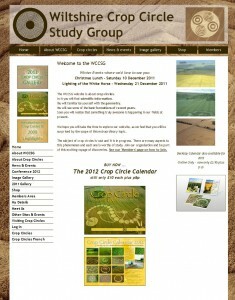 At the head of the U.S. crop circle research BLT Research is William Levengood. In his own publications and in the work of his colleagues can read that this gentleman a PhD and there is usually ‘Dr.’ for his name. Even in the popular but misleading series ” Ancient Aliens “Levengood is depicted as a doctor. Graduate and expert in alternative phenomenon, his results insinuate scientific value. His team is ” the worlds leading research group . Turns out, however, that he does not hold the title. The jokke chunks on a scientific title is a sturdy blot on the escutcheon. 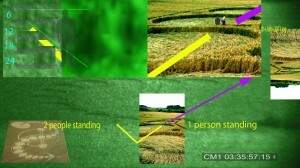 The whole was not spotless, because blindly support the BLT Research indicates the Dutch ‘crop circle discovered’ and paranormal medium Robbert van den Broeke was already quite debatable . Lately Robbert experimenting with new tricks and also to various celebrities and creatures for his camera. In some cases you can still see the traces straight cut and the original image can be traced back to the books or websites where they came from. Robbert explains this by himself to think that he draws from the Akashic field , the source of all knowledge. And of course, why would the Akasha field use the real image of someone as it can just draw. Wikipedia or a book Also Akashic field must move with the times. Well, of course we think Robbert Flest the lot and that the matter of time before he falls to his supporters through the basket. From America to the Netherlands: fraud left, right fraud . 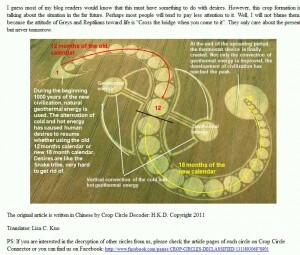 Ask us especially what is still standing remains of the crop circle phenomenon, because we do not know. Almost everything is invalidated or has a discernible human or natural origin. Unless maybe the orbs where witnesses continue to talk about ? 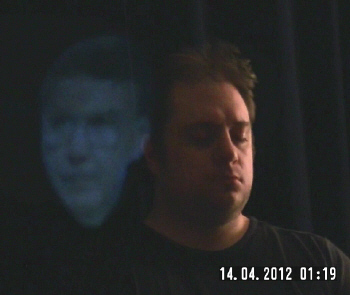 a youtube video interview by Ufohunter taken at the Grove Hotel in Watford, Near London. George Bishop will be our guest. 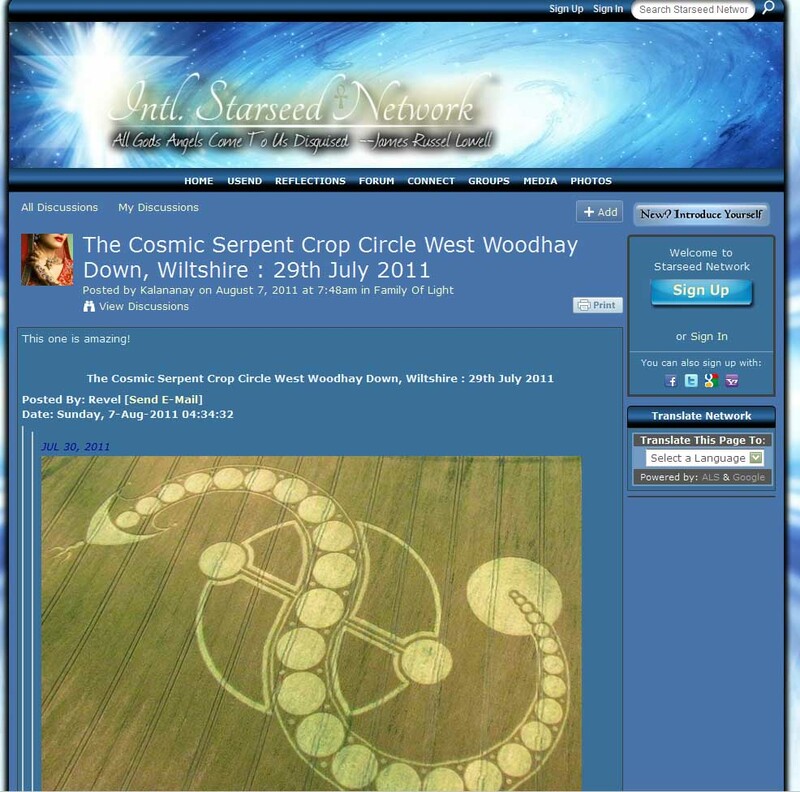 George is a long term researcher and journalist on crop circles who is very well known in the UK and amongst many foreign crop circle interested parties due to his working on CCCS magazine. Here is Georges CV. He will be joining us on Skype and we should be able to take calls from guests this week… fingers crossed. “I was involved with CCCS from 1990 although I didn’t “join” that organisation until about 1994. 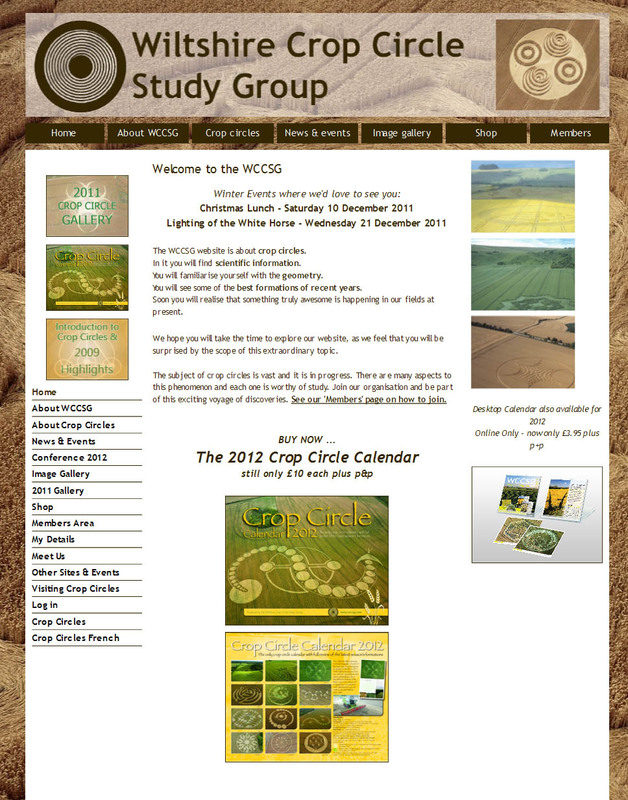 I was Chairman of CCCS and Editor of their quarterly journal The Circular for many years. (The longest serving editor.) 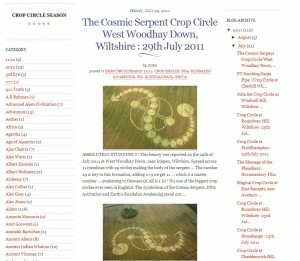 Organised several Conferences on Cropcircles at Bristol and Andover. 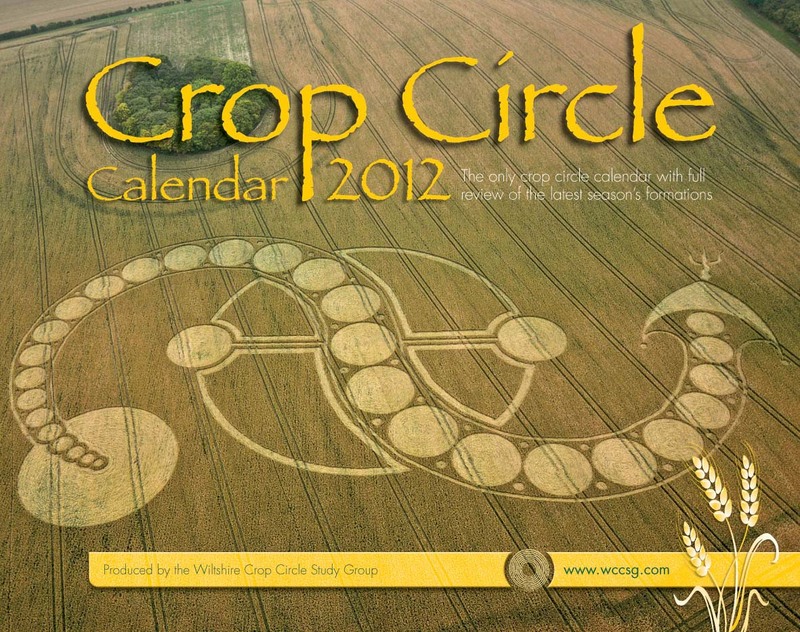 Helped to edit several books on crop circles. 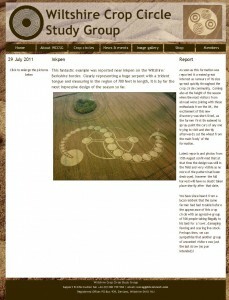 I worked as an artilcle writer for a Devon magazine which is why I went to see my first cropcircle. Co-operated with PUFORG (Plymouth UFO Group) on an investigation into Bols and orbs. Have had a number of UFO related experiences over almost 60 years. Mr Rob Buckle is the guest. 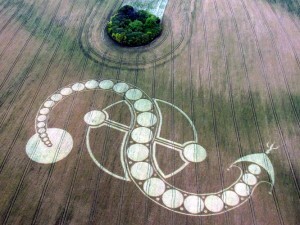 He is a creator of youtube videos on crop circles whic have gained hundreds of thousands of hits. His research of the circles has led him to believe that humans are making the circles. We explore why. Tune in to the show and ask Rob questiosn live via our text chat on the channel. News for CirclemakersTV… we have a pretty fast broadband connection again – back to 80k up from 40k which is a very curious thing considering we were forced to live out in a village which you would expect to have slower broadband – the universe provides… so we are getting back to the Devizes old studio standards. Yay… so expect better quality broadcast live for future shows. Ofcourse youtube uploads after the show is broadcast will be the same perfect quality but its nice that people watching live will no longer have to suffer a slighter slower jerkier quality. So the Bstards couldnt keep us down! Ha. We will do a test show at the increased data rate soon and hopefully the results will be pleasing. 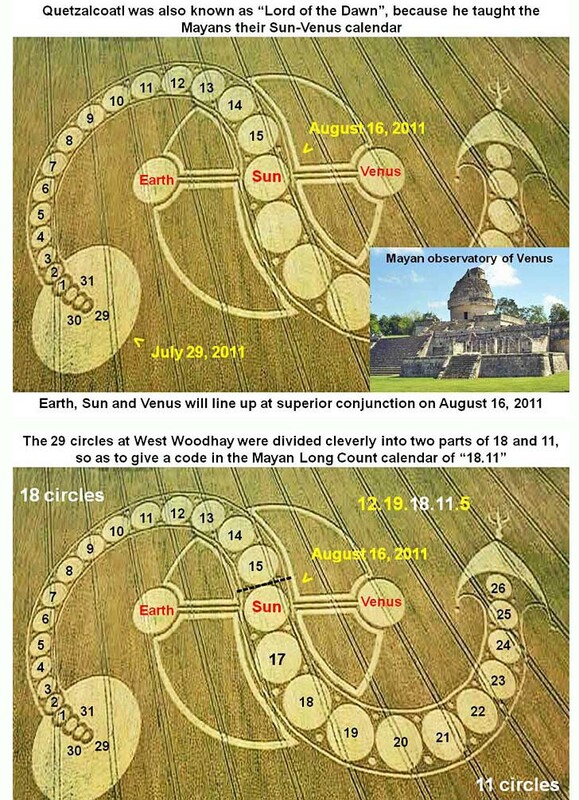 Also we have some interesting news on telepathic coincidences in making crop circles which was revealled to me in a very syncronistic meeting. More on this exciting and intriguing story on the next show. Weds 21-12-2011 if not arrested due to the retards. live chat available and we will have a guest via Skype on the show. Be the first to get the major revelation which will be revealled on the show. and if we dont speak to you before have a Happy Xmas. HATS off to the circlemakers who made this the seasons biggest, best and most loved circle and MOST MAN MADE 😉 We owe you a pint. In any case, at West Woodhay Down, we are being told to BE AWARE! LISTEN TO THE RATTLE! DON’T GET HEATED AND STEP INTO DANGER! STAY COOL! ROLL WITH IT! see what the Chineese researchers had to say on the Crop Circle Connector site… Aliens – Greys… reptilians… wow… very cosmic indeed. Inkpen – This fantastic example was reported near Inkpen on the Wiltshire/ Berkshire border. Clearly representing a huge serpent with a trident tongue and measuring in the region of 700 feet in length, it is by far the most impressive design of the season so far. 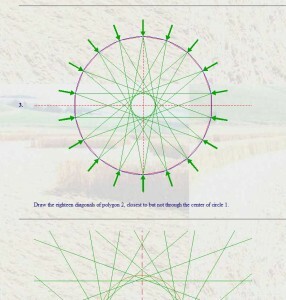 AKA… HOW TO OVER-COMPLICATE DESIGNING A SIMPLE CROPCIRCLE OTHERWISE KNOWN AS Mr Zef Damens website…. a real mind blower of epic proportions – a must see! THE CONTROVERSY HAS STARTED -but so far is a bit of a damp quib. Mr Red Collie some bloke who says hes a doctor, cliamed that the video footage didnt even look like the same field. Wow, frame grabbing the footage at 1:35~:00:00 and comparing it with this photo uploaded as a comparison by a Russian fellow on facebook I was able to come up with the following Animated gif which flips between the trees – showing without a doubt it is the same field. Now how Red Collie can make such vast statements without even cursory research is yet again proof that we are not dealing with reasonable researchers -more proclaimers with no proof. Also its hard to see that the formation is exactly lined up using a similar method to the above because the lens distortion factors are different so there is a stretch taking place (probably on my night vision camera) and also the photo had been taken from a slightly different hillside angle – they daytime show being with the cameraman situated to the left of where I would have had my tripod and the night vision footage seeing the serpent spun slightly clockwise from the daytime photo. I suspect that I may have also been slightly higher up the hill than the daytime photographers position due to my photo being slightly taller and having a more “looking down on” angle than the other. This photo is lined up in a general sense for the FORMATION. 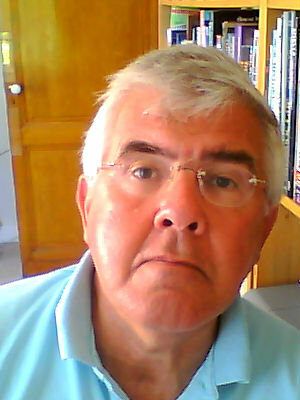 I will do my best to answer anyones questions via this page as a permanent record as Facebook is a piss poor way to archive stuff as it disappears from view too quick. So if you ask me stuff on facebook I will reply there and also up here. 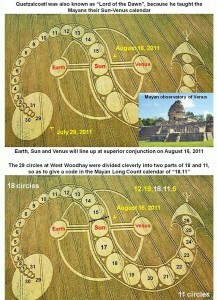 So it IS the same circle, and same field. The sun did not shine for 2 hours, but it was a light from the house (seen on the daytime shot) that is prominent with night vision cameras. And added a photograph which marries up with the above, so it is clear that like Canus Rufus with a little effort, anyone can see this.Here is their photo. CLICK TO SEE ENLARGEMENT. AN OFFER TO SETTLE WORRIES ABOUT FOOTAGE ONCE AND FOR ALL. It would see evident to me that there are two ways to allay any accusations that this is fake footage by giving a copy of the raw darker original 5 hours to whoever wants to act as an investigator. They can study the types of look and feel of the footage and it can be a direct HD tape to tape digital duplication – which is loss-less, its as good as the original – has interlace fields present and everything, timecode signals -U-BITS data. Next we can take the camera and night vision unit as was used on the night to the same location as the Serpent was in and set up the same shot from roughly the same location. I think I should be able to find it quite well as I had to jump over a fence several times to go back to my car to recharge batteries and swap them over into the camera to continue the 5 hours of shooting. We would only need to shoot say 20 minutes of footage with the range of lenses on that i used on the night and in the 3 different light setting modes I played with on the camera… slow shutter and normal shutter modes. Provided it is a dark overcast night with no starlight or moonlight it will look much the same as in this footage. We can film on the camera and provide this tape so people can see the lens distortions are exactly the same, the light levels and speckling is exactly the same. We will be able to establish that the trees are in the same place and we can see the light from the country house in the distance doing the beach/bloom effect – provided they have their outdoor lights on like they did on this night. With the comparison footage I don’t think anyone will question then that this is what the footage looks like when you shoot it on this system and is in no way some form of digital mockup. 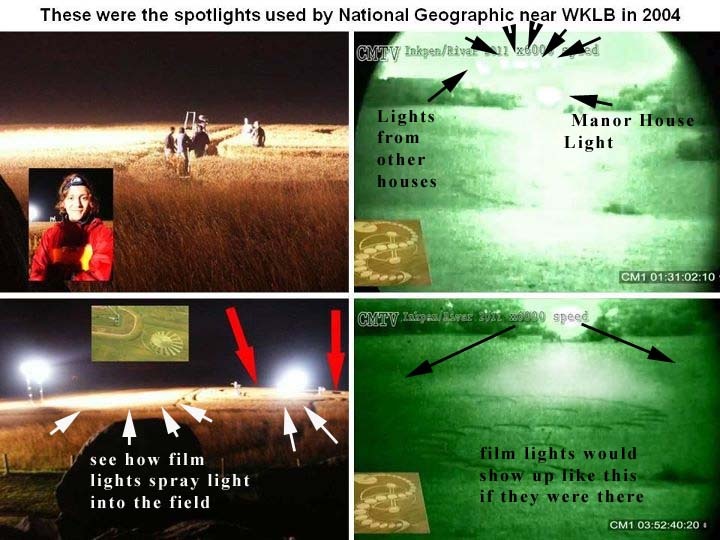 Someone can even walk down into the field and move around with LED torches and a red laser and we can film these so they show up in the same way as they did on the footage. 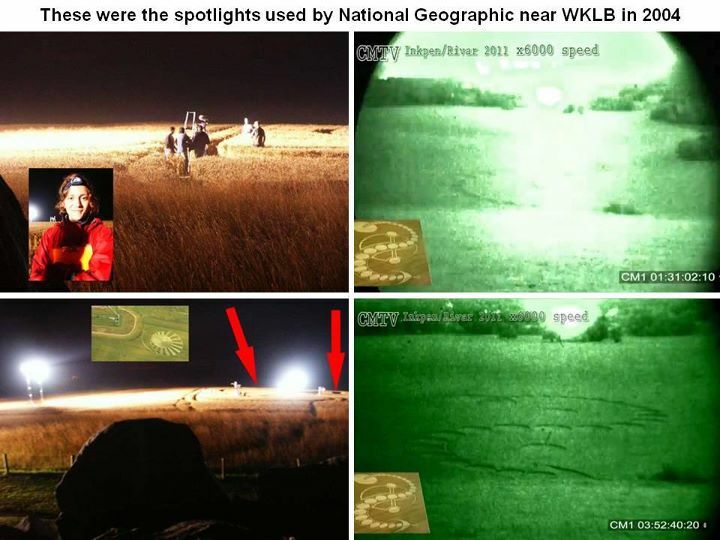 I am prepared to do this if people like Red Collie will not accept that this is real footage and we will take with us a researcher of Red Collies choosing – provided they are not a certified lunatic. The point is here that is is so much HARDER to fake footage like this than to actually just go to the hill and shoot circlemakers making a design, which is what we did. To fake something like this and not leave behind a whole raft of give away faults would be a tremendous undertaking. 5 hours of footage is a VAST cgi effort by any standards and I am certain there are will be no evidence of fakery ever found because there is none. The footage is exactly as was shot on the night plus captured in full 1920×1080 25fps interlaced PAL format and the brightness and contrast increased to make the image clearer to see. Thats it. If people cannot accept that this is how this footage was shot if they make proper representations to me that they want this evidence verified that this is how it was shot I will go the extra mile to provide that evidence – but I am only preapred to do this with fully up-front people who are in proper communication with us – not anonymous facebook users. So there we have it, accept its real or I will give you the extra evidence to prove that it is. Im telling you now though the evidence really is easy to get – just a drive back to Inkpen at night… but if people want to do it, and be there to watch us I am happy to help. If people like Red Collie prefer to block users like myself on facebook so they cannot reply to his denials then this to me is not a proper way to deal with this. There needs to be a proper open line of communication for this to take place. Its very easy to sit behind a keyboard on the other side of the planet and say things like “looks totaly fake and CGI”. If you want to make statements like that enter into a dialogue with us and we will help you understand that you are wrong. It may help for people to see the raw original tapes, unedited, uncompressed and then youtube adds its own layer of compression “scumming” (as I like to call it) onto video so it doesnt give you a true HD look by the time you see it on youtube. The original files are so massive we would ave to supply either HD DV tape for original footage but I am also considering uploading the MATROX edited original 6000xspeed and 30000x speed versions which are 3 GB and 1GB to a file sharer site for people to download if they feel so inclined. Do people wish me to do this to see the highest quality possible – if there is a call for it I will do it. I have uploaded a video to youtube which helps explain the question of “were film lights used”. No film lights were used as these would have required power, cranes and would have given away the location of the circle being made and the farmer would have seen what was happening. Clearly without the permission of the farmer you would never get away with film lights for several hours. Red Colon (as we like to call him) has been going into overdrive to find excuse after excuse as to why we didn’t/couldn’t have made this video of the making of the crop circle. Now it seems he has reversed his position under pressure of our making rather common sense arguments against his statements. In the above picture you can see that film lights are rather bright and very noticeable from a distance. This obvious fact seems to have eluded Mr Colon who forgets/didnt bother to research that the farmer at Inkpen was very edgy about his fields and land after an Illegal Rave party was held on his land a few weeks earlier. 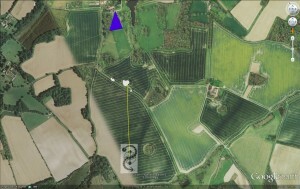 He was driving around a lot and had he seen Circlemakers working in this field he would have intervened. Testament to the fact that the farmer was very upset about the formation came in the form of threats of physical violence to visitors to the formation and a threat that if anyone went in that he would cut it out. People went in without permission, he quickly got his mower and cut out a lot of the formation and then made further threats to people that he would damage their cars if they tried to visit the formation. This doesn’t sound like the type of reaction of a farmer who knew anything about the formation going to appear. So the idea of film lights is completely out im afraid. Just to be clear though some people have pointed out in the above photo upper right quadrant that when the frame suddenly gets brighter, which happens because of my manually operating the manual gain control on the night vision to see what adjustment is best before the picture bleaches out or gets too grainy, that a row of lights are seen above the larger security light. People seem to be wondering what these lights are. I am not certain if they are from the mansion house or from other houses nearby. The only way to tell would be to go back and film again – however these seem to just be street lights or house lights which are highly amplified by the sensitive night vision. Bear in mind that even someone smoking a cigarette some distance away from night vision equipment can be seen like them pointing a torch at you! This means that these light may be fairly dim or possibly even invisible to the naked eye but appear on the night vision. I see nothing suspicious in this. 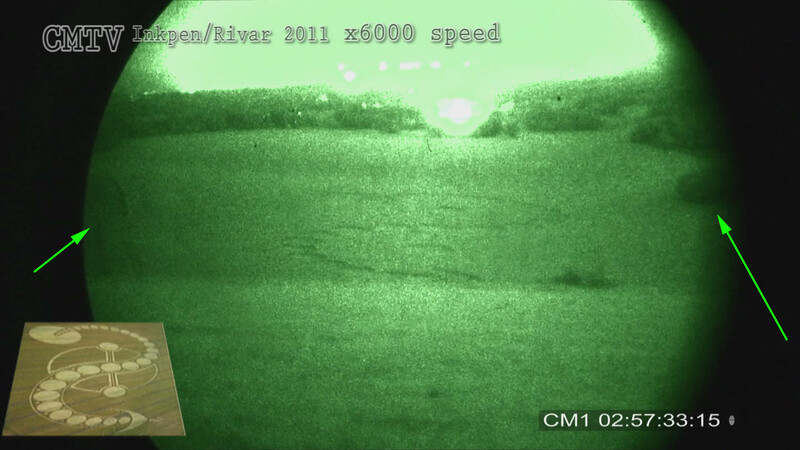 Finally if there is any question as to why the image is brighter in the middle when the iris is turned up – I could offer that towards the edge of the night vision the picture does get slightly fuzzier and darker . So it would be a natural thing for the areas you are pointing at to bleach out if you turn the gain sensitivity up. 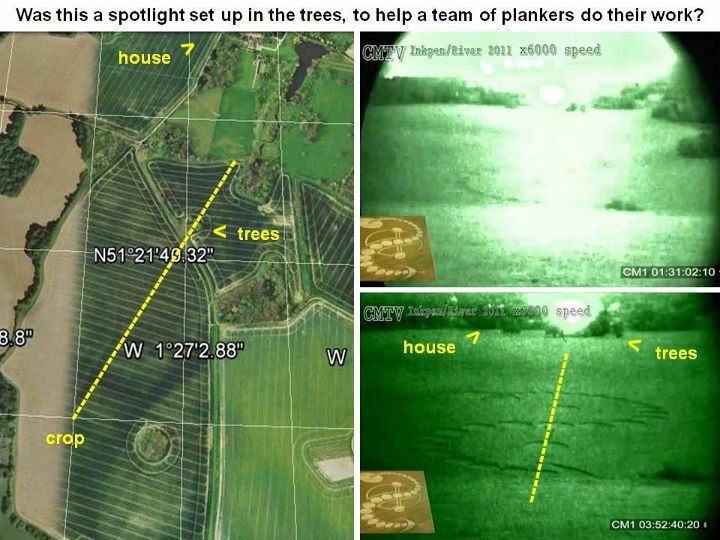 Seeing as there happens to be the security light in the distance and this is casting a small amount of light towards us – this would account for slght beneficial shadowing of the walls of the flattened crop. The same effect of shadows would be observed by even the moonlight or a bright cloud overhead which could cast shadows. I have a piece of night vision footage shot on a bright summer night when there is a bright cloud overhead and this shows up shadows of trees. Below is my alteration of the photograph to give a sense of what film light would have looked like – were it used – which it was not. Also take note of how close the film lights are to the National Geographic Circlemakers. See how the light issues forth in an egg/oval shape infront of the lights and quickly dims away. In the nightvision I would say that the light is brighter near the top of the frame and then dims away. 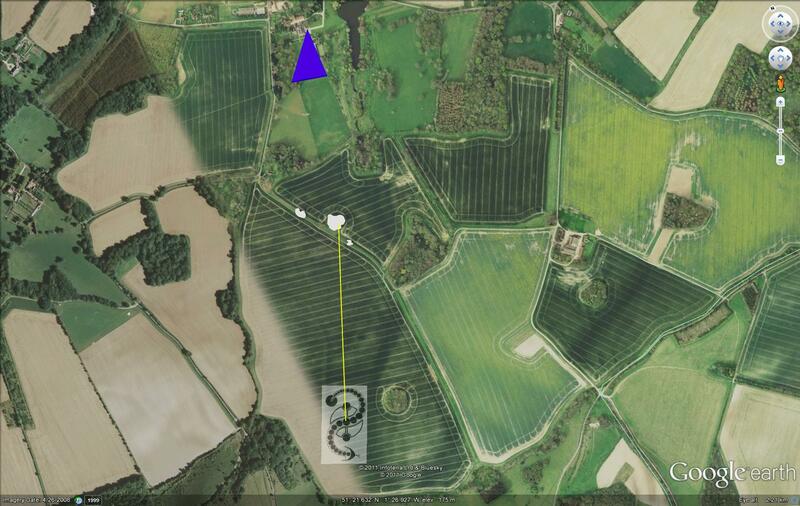 You would expect lights trained down into the field to create the egg shaped spot infront. 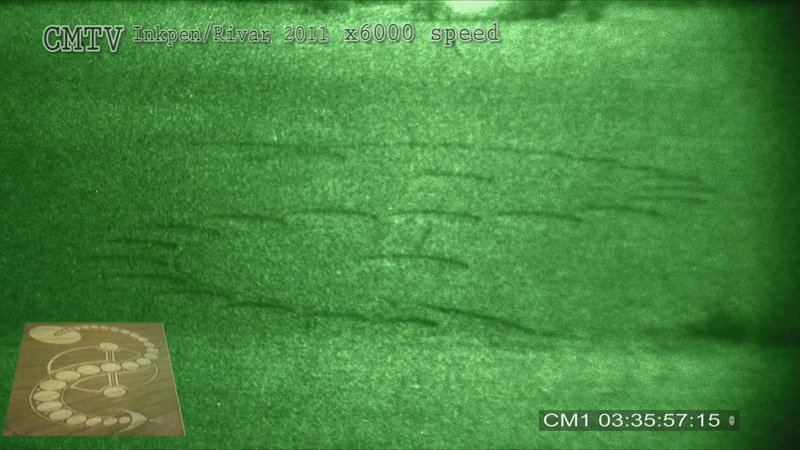 What we see in the nightvision footage is more of an hourglass shape so is the complete reverse of what you would expect to see with film lights. If such lights were pointed directly at the camera you would probably not be able to see anything in the shot due to overloading the camera with light. This photo was supplied to show a percieved angle from the filming position on the hill towards the trees. 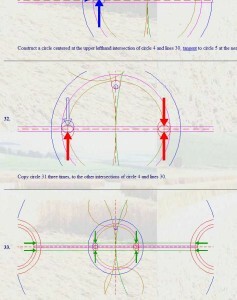 I have done an analysis with Google earth also and I find the angles to work out fine for my position. Red Colon has INCORRECTLY pointed in the lower right quadrant with a very sloppy line up and anyone can see that the lower circle lines up – the middle circle is off to the right and upper circle should be much further over again. See below. A quick glance may have been all people got of this photo but as with any angular deviation even a tiny wrong angle will cause a bigger deviation and steer away from the house – so clearly we cannot “let this slide” (pun) and had to point this out. I am sure you can now see – putting film lights that far away from the object you want to light is extreme. 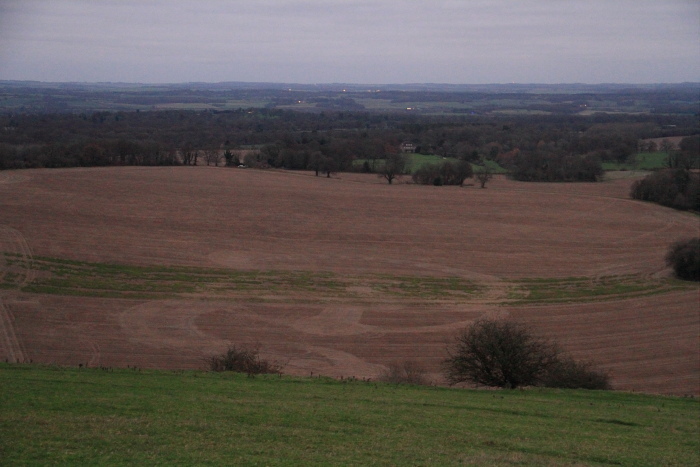 Something I have noticed is that the field is not flat – it slants towards the hill. Also at the point where the centre of the serpent is happens to be a kink in the field. 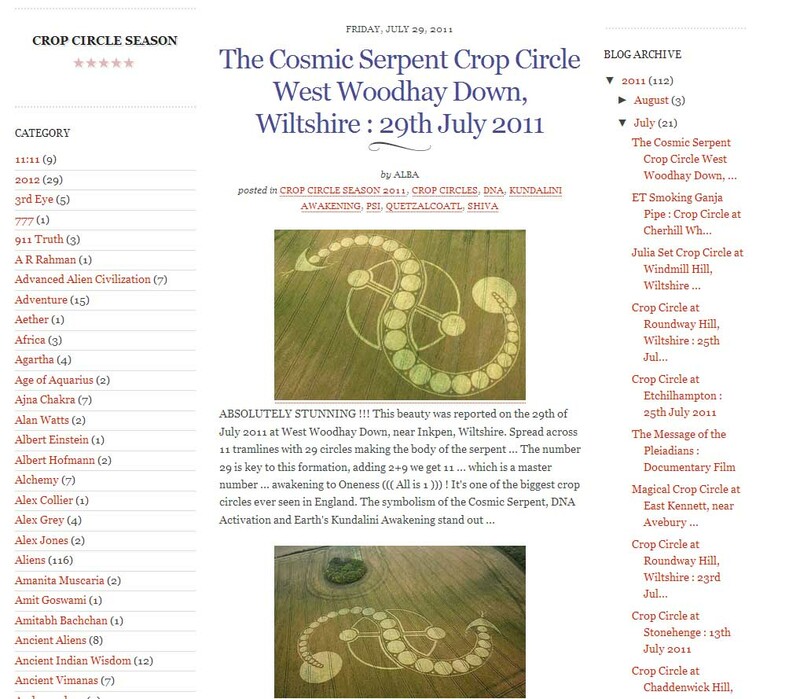 This could just be data innacuracies in Google earth but its worth taking into consideration that when you view the serpent to line things up from the side view it will fool you… and you do need to view from above to get correct line up points. Red Colon also states that the light comes on at 1:30 and stays till 4:00. To be more precise on this what actually happens is the light is probably there the whole time before 1:30 but the camera is tilted down so you cannot see it. Only at 1:30 does the camera tilt get played about with by me and we then have the light in shot. Well the circle was over 11.5 lines and taking into account the fact that the video is slighly blurred then one must remember that pixels will bleed in size over into other areas- however taking a very rough look at a simple frame grab from a random piece of footage – no special reason chosen to pick this bit apart from the fact that you can see two circlemakers, we can then compare like for like in a circle of “similar” size to the one in the nightvision footage. 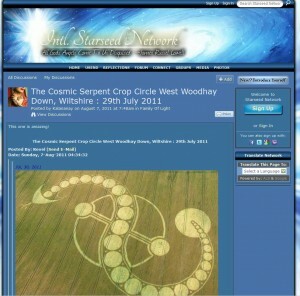 When I say similar I have to say it was hard to find photographs of people standing in the circle in daylight – most people like to publish photos of the Serpent with no people standing inside. If you can find any photos of people in the circles you can try this yourself. That being said it must be noted that the circle the nightvision circlemakers stand in is a SMALLER circle than the one that the daylight circle person stands in. This will then have the illusion of making the circlemakers seem marginally bigger in relation to the circle they are in. This is however an illusion and you should take it into consideration when viewing this analysis photo. 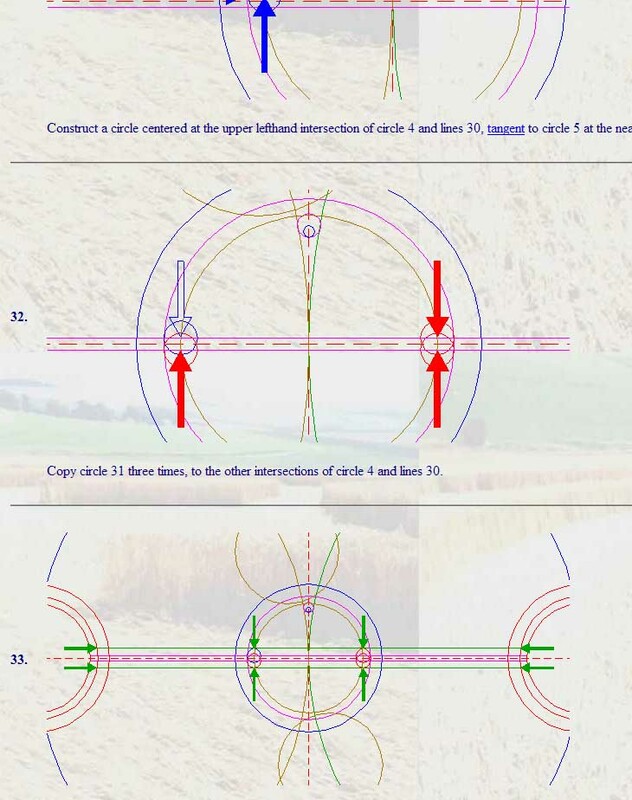 Also you need to bear in mind the camera lens may be a different distortion range and the angles the daylight circle were photographed at are different so things may not appear exactly how they were. That said i think ones 3d imagination and common sense can put together the concept that the figures are about the same size… there is a need then to quadruple the height and scale of the nighvision circlemaker in order to make him 25ft high… As you can see in the photo below – when you make the circlemaker that size there is no comparison. Below: is the frame I grabbed from the video. Below: we see the Circlemakers and the daytime circle visitor in roughly the same scale, also the pink line shows you where the daylight photo would have been taken – I spun the image 180 degrees to fit in in the same region as an example. Below: A blowup of those regions reveals more detail of the 2 circlemakers versus the daylight visitor (whos legs “may” be obscured by the edge of the circle. Below: So finally just for fun – what would a team of 25ft circlemakers look like in comparison to to the original footage? Here’s what! 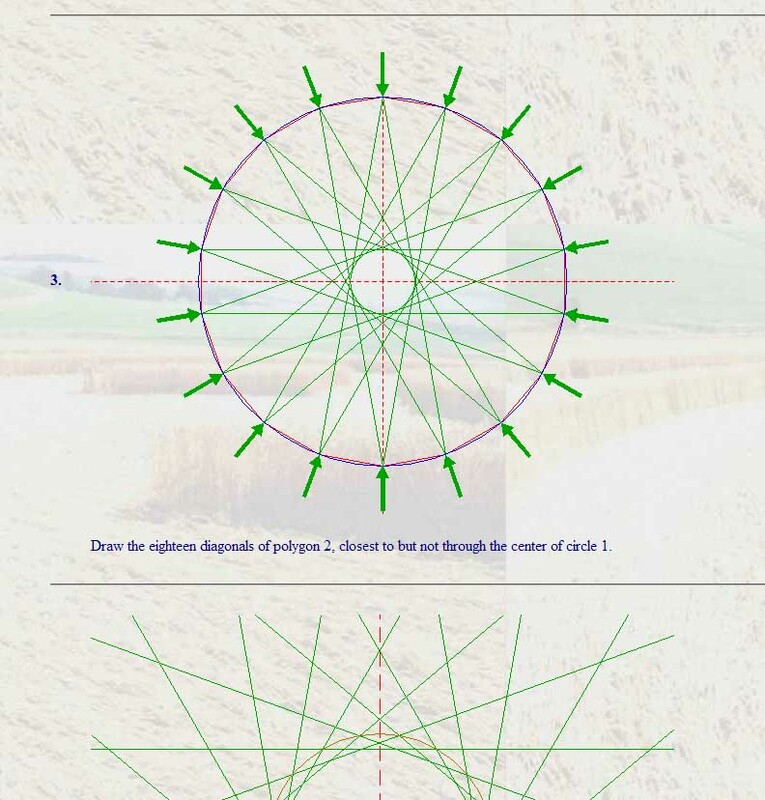 And at 25ft high these circlemakers should have completed the 600ft (Im not sure of its exact dimensions BTW) crop circle in about 20 minutes. Knee jerk unresearched opinions yet again form the denials on youtubes comments section for the video. Loudly again a user has a go at refuing the authenticity of the footage by stating that the ring of trees cannot be seen so this cannot be the “landscape seen in the picture”. 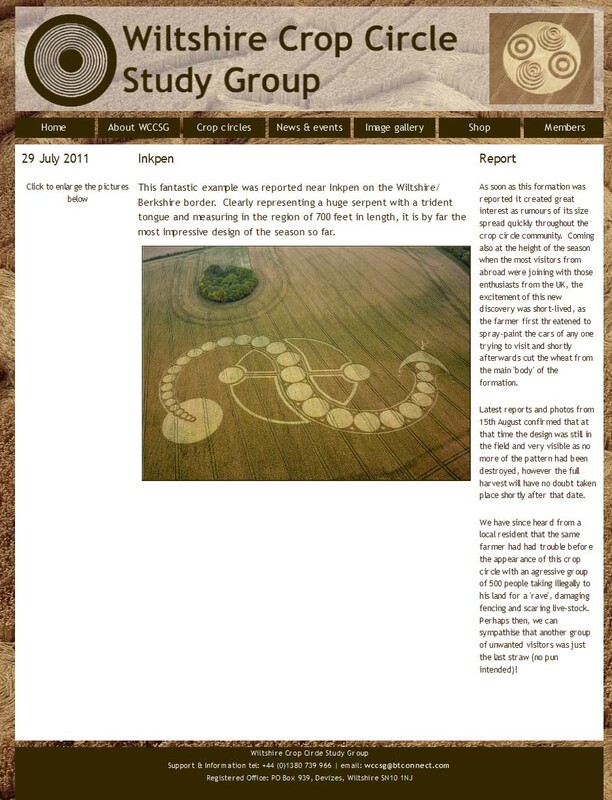 ABOVE: Borrowed from the crop circle connector website we see the “island” of trees Feuerbringerin is referring to. As an aside point, yes indeed quite remarkable and cute. However a lof of people dont realise that sadly a lot of copses like this are kept for the purposes of rearing fox dens so there are foxes to hunt. Admittedly watching youtube videos is not always easy as it doesnt have a slow motion function or frame by frame advance. However if anyone wants to download a hig res copy of the footage to check then use www.keepvid.com which is ahandy utility for ripping off youtube clips. Now with it on your hard drive you can use powerful software like Kmediaplayer or VLC media player to slow motion the video and check it out. 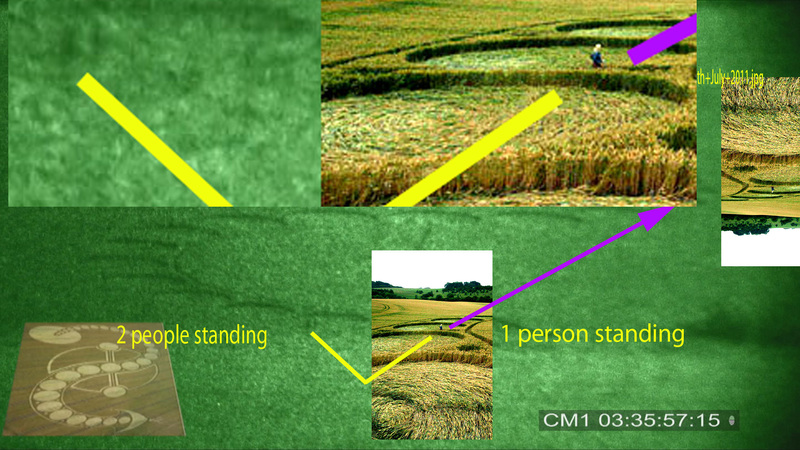 Our video analysis reveals the following timecoded sections which do show the “island” of trees. The final frame grab we show below is the nail in the coffin for this debate as the “island” is clearly visible as is the left hand side of the field which has “tractor tram-line” marks visible. 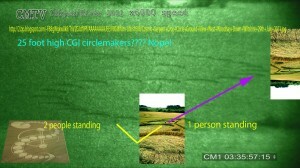 Times to look for footage are as follows: 1:50:25:10 shows shadow on right which is the circle of trees in the same field. 2:2:14:20 camera pans and tilts for just a couple of frames and again you see again. Not clear but then it is in the edge of the lens of the camera which is distorting/blurring and making that area darker. As I change lens and setting at 2:57:33:15 is very clear showing trees and even left hand edge of field! 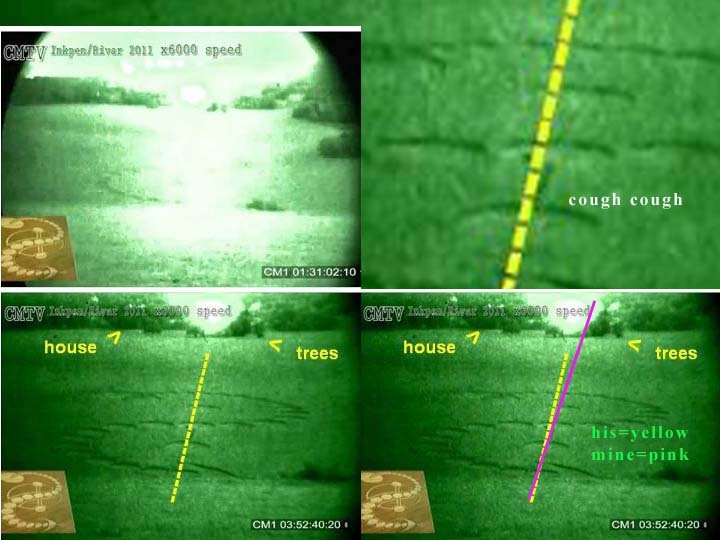 Proof positive trees were there! @Feuerbringerin Also the BUSH you refer to is not in the field but actually exists on the sloping hill on which the camera is situated. As the hill rolls away steeper and steeper you think you are seeing something in the field. However much more of that bush is visible if one stands up, raises the camera or walks over the steepening slope of the hill the camera is on. ABOVE: An example show to the hill I was sitting on taken by another photographer. Bushes are visible but obscured slightly. 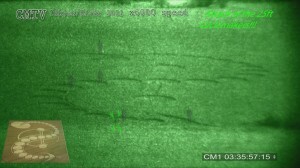 If the correct position was obtained then this would show the left hand bush in the above photo positioned to the right hand side of the night vision video footage . We will be doing a show that will blow your socks off… all the details behind my arrest due to Agent S failed fake assault shenanegans. You will not believe what you are about to hear in this show. I fully expect there to be quite a kick back reaction to it.